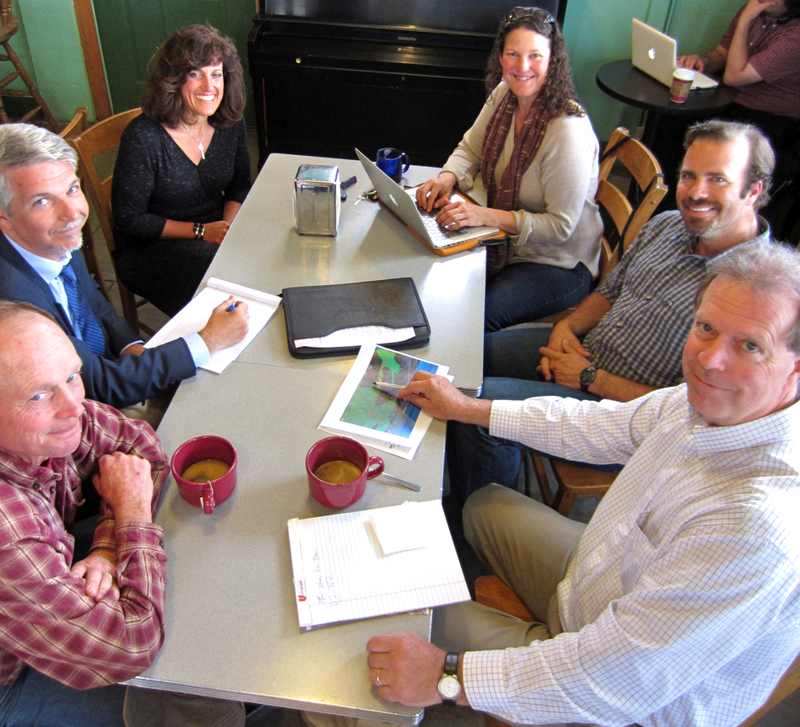 It seems like yesterday that Alex Stillman “strong armed” me into attending a trails meeting at the coffee house. Much time has passed and so much progress has been made! I want to share some thoughts with you. Alex didn’t “ask” me to attend the little trails coffee clique. In fact, she “told” me I was to go (WHO can say no to Alex?). The word “trail” was a foreign language to me because I never stepped from my deck to my wooded backyard. I was intrigued by the commitment to this project (which didn’t have a name or logo in the beginning) and wanted to just listen to this group of strangers talk. They spoke a language that was completely UNFAMILIAR, using terms like “property rights and easements,” and I was pretty intimidated by the wealth of knowledge this group had. Mark Andre was the quiet, politically correct and well-respected grant writer of the group (I Googled his accomplishments), Steve Lovett was a softspoken hippie-type kind of guy who knew a ton about maps and trails; Uri Driscoll was a passionate horse person – that I later learned were called “equestrians”; Georgianna Wood was the “organizer” of the group; always keeping historical data in order and herding the butterflies; Travis Turner was the uber-cool college student who wanted to be involved in his community; Alex Stillman was a woman of many powers and a go-getter, Kevin Hoover was the snarky editor of the local paper who loved the trail; Mark Lovelace was the guy who ran for supervisor against my boss, Bryan Plumley; and Kirk Cohune was the guy who knew how to manage projects and get peeps on the same page. An eclectic group of individuals yet passionate about the same cause, the Arcata Ridge Trail. Unlike any Board of Directors… a simple committee of people from all walks of life that all got along and looked for solutions to problems. The familiar thoughts of WHY WHY WHY entered my head. I wondered why Alex brought me to the meeting? What I could offer this group? I was wayyyy out of my comfort zone, I knew NOTHING about trails or the outdoors, I had never gone hiking, horseback riding, kayaking or bike riding. One thing was for sure, I was MUCH louder than ALL of them combined! I quickly found my place among this group and what my role would be in all of this trail stuff. I wanted to throw a party. A giant party like never before seen in Humboldt. I wanted to bring groups of people together that had dislike for each other, I wanted to make a small difference in this community and I wanted to network with folks I didn’t know and I wanted to make some new friends along the way. When Bat ’N’ Rouge was born, the trails committee thought I was nuts (YES, I saw eyes roll) but that gave me the energy and determination I needed to work on something silly and fun with my dear friends Todd Larsen and Michael Weiss (aka Sister Fawn). We’d either succeed or fail, but one thing was certain, we were gonna have a hell of a lot of fun while raising a few bucks and community awareness! This event brought together people from all walks of life (remember Randy Gans and Pete Nichols played on opposite teams). Politico’s and Notable’s in DRAG all playing softball for the trails, the Eureka Sisters of Perpetual Indulgence, the Marching Lumberjacks, the Roller Derby, the Good Relations employees, my super-special Pom Pom Queens along with over a thousand awesome community members supported this event. Was it for the trails or was it for the fun? The amount of money raised was NOTHING compared to the nexus of different people coming together for a common theme and a night of fun. For one night, personal attitudes and differences were put aside and EVERYONE got along. How cool would it be to make this an EVERYDAY occurrence?! Next up to support the trail was Uri’s horse BINGO – equestrians got to ride their horses, play a game and raise money. Now it was time for the Race for the Ridge – mountain bikers got to ride their bikes through the Arcata Community Forest… PLUS we were ALLOWED to serve beer at Redwood Park…yes, these three amazing events brought awareness and dollars to the Ridge Trail, were super fun AND brought the community together for a common goal. The Ridge Trail Project also had a very personal and profound effect on me. Not to be overly dramatic, but) it changed my life in a way I never thought possible. I gained a wealth of knowledge from the Ridge Trail committee about things that were “outside” and interesting, things like hiking and biking, and words like “easements” and “property rights” became part of my everyday language. I made new friends, I ventured off my deck and into the woods, I learned to enjoy the outdoors like a true Humboldt County resident, and the most important gift of all, because I met Kirk via the trail. I learned how to ride bike. Yes, because of the Ridge Trail and all of you, I was able to make a major lifestyle change by dropping weight and getting healthy from the inside out. I’m still the same person (my mouth hasn’t changed) but a smaller version, and now life behind the Redwood Curtain much more enjoyable. Volunteer outside of your comfort zone and do something totally different!!! Get involved with our community, get politically active, do something for the envirorment, help out with kids causes, animals, maybe do something about health and fitness, the arts, homelessness, or help me with my next mission of getting safer places to bike – ESPECIALLY along the 101 corridor! The list goes on and on, ESPECIALLY in Humboldt, but I promise you that whatever volunteer activity you decide on, it will be satisfying – AND if you’re lucky like me, your life will change for the better. Debi Farber Bush demonstrates blithe disregard for America’s dwindling reserves of capital letters and exclamation points. This entry was posted on Tuesday, March 26th, 2013 at 12:05 pm	and is filed under Opinion. You can follow any responses to this entry through the RSS 2.0 feed.